After eight months and 18 races that have seen two childhood friends battle it out for the greatest prize in motorsport, the season finale in Abu Dhabi will take place this weekend - with Formula 1's driver's world championship still to be decided. Britain's Lewis Hamilton is on the verge of his second world title, six years after his first, with a 17-point lead over Mercedes team-mate Nico Rosberg. But with controversial double points on offer for the final race - 50 for the winner - at Yas Marina, along with the threat of mechanical issues creeping in following a long season, the 2014 title could still go either way. From the moment pre-season testing began in January, it was clear Mercedes and their two drivers Hamilton and Rosberg would be difficult to beat. And so it proved, with the pair sharing 17 of the 18 pole positions between them and securing 15 wins as they fought out a private battle for the title. Hamilton began the season on the back foot, with a retirement in the season opener in Australia and spent the next few months clawing back the deficit. But it was not until the Belgian Grand Prix in August that the momentum looked to really step up. When fighting for the lead, Rosberg turned in on Hamilton, puncturing the Briton's tyre. The battle lines were drawn. The Abu Dhabi Grand Prix exists in a pristine bubble, the sort that Formula 1 too often resides within but which has been punctured by the troubles of recent months. The arguments currently dominating F1 - the cost of the sport, the survival of the small teams and engine developments - will seem incongruous set against the sheen of wealth and privilege represented by the gleaming Yas Marina circuit. But the track is in some ways a fitting place to end the season. Just as in F1 itself, a veneer of glamour generally hides a more uncomfortable reality, so the glimmering, colour-shifting Yas Viceroy hotel and perfect-painted borders of the track distract from the fact that as a venue to generate good racing, Yas Marina is sadly lacking. A great "facility" it may be, as almost everyone in F1 will say. But despite an effectively bottomless budget, a great race track it is not. Hamilton responded with victory in each of the next five races to turn a 29-point deficit into a 24-point lead with two races to go. In two of those races, Hamilton caught and passed Rosberg on track, with the German unable to respond. But in Brazil, just as Hamilton looked set to take the lead from Rosberg, he pushed too hard and spun. And though he re-caught Rosberg, his team-mate did just enough to hold him off. Rosberg's victory cut Hamilton's lead to 17 points with 50 remaining in Abu Dhabi. But even if Rosberg wins in the desert, Hamilton needs only to finish second to seal the title. Formula 1 heads to the desert for the season finale with Abu Dhabi's spectacular multi-million pound venue playing host. 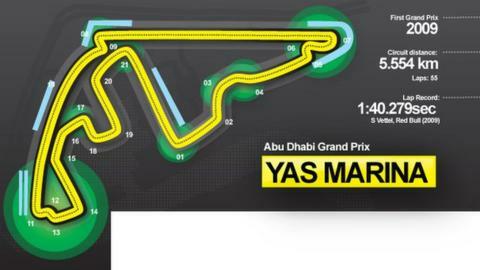 Built on a man-made island, Yas Marina's 5.554km track features three distinct elements - fast and flowing turns followed by two long straights and finishing with a tight and twisty section. It is a twilight race too, so the grand prix starts in daylight and finishes in darkness under the floodlights. The stunning 499-room Yas Hotel, which uses 5,389 pivoting LED panes to produce a spectacular light show, straddles the circuit. While over the way you will find Ferrari World, home to the Formula Rossa roller-coaster that has a top speed of 240km/h. The venue's capacity is not massive at just 41,000 people but that is because the focus is on offering a luxury experience, with VIP hospitality the focus. Fans will also be treated to post-race concerts headlined by Pharrell Williams, The Who and DJ Armin van Buuren. Yas Marina has experience of a Formula 1 title showdown - and it was one of the most exciting in the sport's history. In 2010, four drivers - Fernando Alonso, Mark Webber, Sebastian Vettel and Lewis Hamilton - were mathematically in contention to win the title. Alonso was favourite with an eight-point lead over Webber, and Vettel a further seven behind. Hamilton was the outsider, 24 adrift with only a maximum of 25 available. Vettel led away from pole with Hamilton second, Alonso third and Webber fifth. If things stayed the same, Alonso would clinch the title. But Red Bull gambled on an early pit stop for Webber, and Ferrari covered it by pitting Alonso. It did not pay off. Both dropped down the field and failed to recover. Vettel stormed clear at the front to become the sport's youngest champion, ahead of Hamilton, while Alonso could only finish seventh and Webber eighth.